Ever since I first read Ian Fleming’s “Casino Royale”, I have been captivated by the detail Fleming pays to the food and drink enjoyed by his well-known character. The Vesper, a drink of James Bond’s own creation which he enjoys in the casino in Royale-les-Eaux, is a perfect example of Fleming’s attention to detail. ‘Certainly, monsieur.’ The barman seemed pleased with the idea. ‘Gosh, that’s certainly a drink,’ said Leiter. He watched carefully as the deep glass became frosted with the pale golden drink, slightly aerated by the bruising of the shaker. He reached for it and took a long slip. The first Vesper I mixed used Gordon’s Green Gin, Grey Goose Vodka and Dry Noilly Prat Vermouth, which were the best ingredients I had on hand at the time. After my first glass I immediately developed an affection for the drink, but I knew it could be made better, it could be more authentic. My first challenge was to find a bottle of Lillet to replace the Noilly Prat I had been using up to that point. Before the 2006 film release of “Casino Royale”, Lillet was not as easy to find in the UK as it is today. After an extensive online search and some telephone calls, I ended up taking a trip to Lillet’s UK distributor, arriving just in time to purchase their last two bottles. At this point I discovered that Kina Lillet no longer existed and that I would have to settle for Lillet Blanc, at least for the moment. 3. Recreating the renamed and reformulated Kina Lillet. Gordon’s Export Gin (the variety most likely to have been used in France) was 94.4 proof (47.2% ABV); Given this information, I was delighted to find that Gordon’s still make an Export Gin at 47.2% ABV and eagerly asked the next relative travelling to the continent to pick me up a bottle. 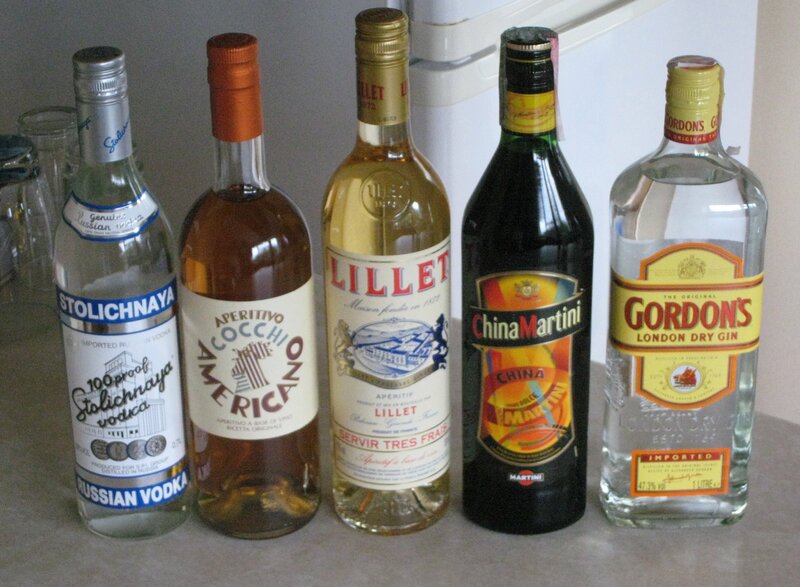 Vodka varied between 80 and 100 proof (40-50% ABV). I took Mr. Wordrich’s recommendation and used Stolichnaya Blue (100 proof). There is some suggestion in the book that the vodka used to make the drink in the Casino was not made with grain-based spirit rather a potato one. I have searched for a 50% potato vodka still made today but am still to find one. (Answers on a postcard please). 1. Angostura Bitters – a method suggested by David Wondrich, add a few drops to the drink – although a convenient and tasty addition, the result was not as bitter as I would have liked, and the pink tint to the cocktail does not coincide with the pale golden colour of the drink in the novel. 2. Cocchi Americano – a substitute for the Lillet, this is a wine aperitif with a bitter kick and was recommended to me by Jay Hepburn of the Oh Gosh blog; once again, a trip to an obscure supplier was in order, but it was well worth a visit. This is a tasty product in its own right and although it makes a good tasting Vesper, I couldn’t shake the feeling that, as the drink contained no Lillet, it wasn’t really a true Vesper. 3. Quinine Bark – A third alternative would be to add a little quinine powder or bark, either directly to the drink, or using it to create a Lillet infusion. I have now sourced some Cinchona Bark and have experimented a little with some success. I think getting the timing right for the infusion is a bit tricky and also working out how best to sweeten the Lillet will take a bit to work out. 4. China (“kee-na”) Martini – a gift from a relative who had recently returned from Italy, this had sat unopened in the cellar for a few years. On inspection, I discovered that it is a product made by Martini Rossi, heavily flavoured with Cinchoma Bark – how promising! 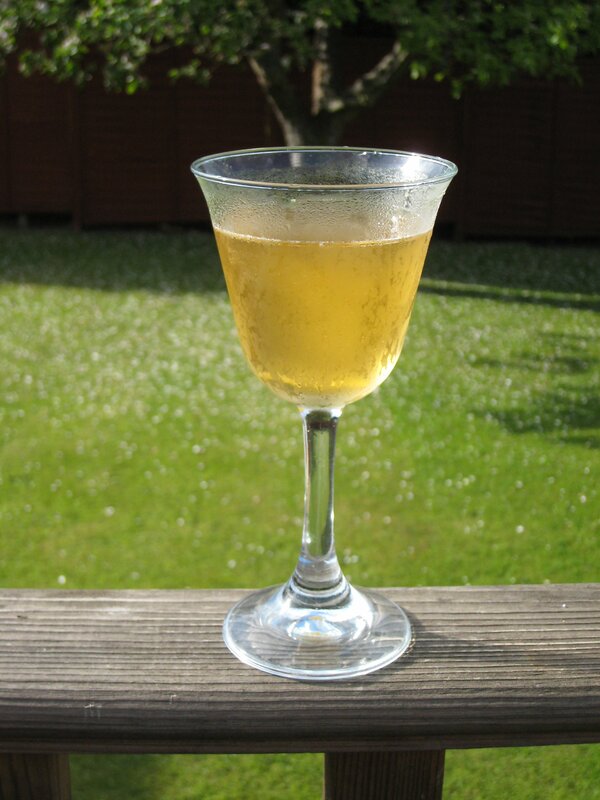 After testing various combinations, I found that a 50/50 mix of this and Lillet Blanc worked best, adding the level of bitterness that I sought, as well as the important pale golden colour described in the book. This seemed to be the closest I have come so far. 5. Jean de Lillet – a reserve version of Lillet Blanc, I cannot seem to find any consensus (even within the Lillet Company)m as to whether this is more or less similar to Kina Lillet than Lillet Blanc. 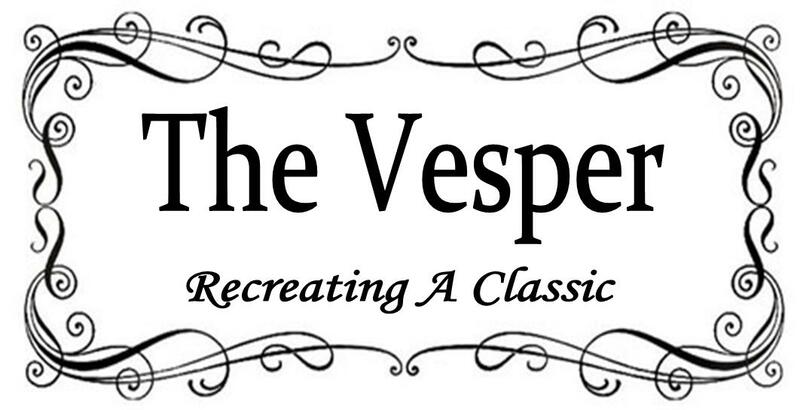 Although my quest for the authentic Vesper is ongoing, I feel that I have reached a milestone. 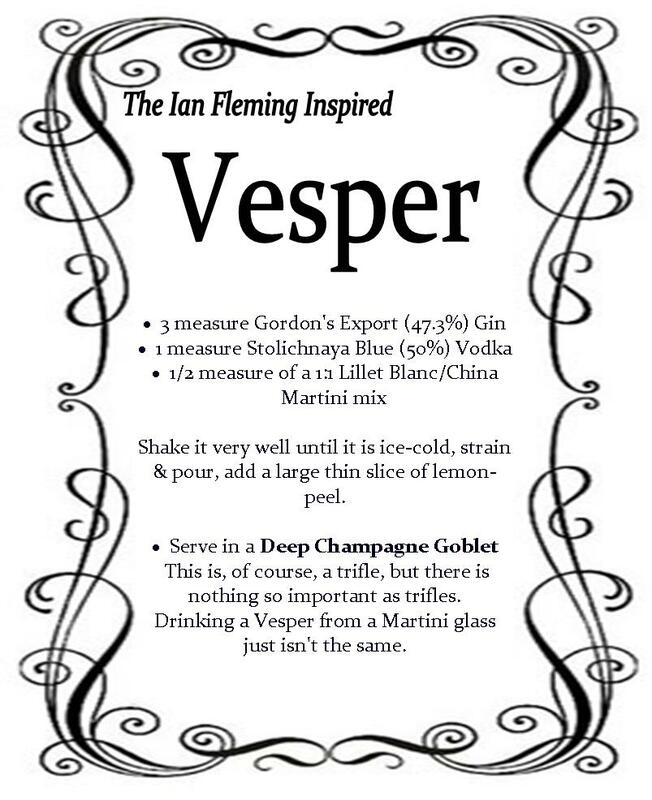 Here is my somewhat work-in-progress recipe for a more authentic Vesper. 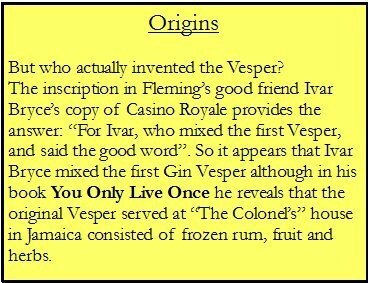 When you’ve spent as much time as I have thinking about this drink as I have you come up with some strange theories, here’s my favourite: The Vesper was that it combined three essential aspects of the book. James Bond, The British secret agent (GIN) The Russians whom Bond is fighting (VODKA) and the backdrop for their encounter, France (LILLET). Maybe the vodka undertones reflect the turmoil of the character? Was this intentional or a happy coincidence? Who can say? But like I said I think it’s rather neat.